Well, they're all pretty negative, naturally. I MEAN. This teething thing? Who came up with this? It is a terrible, terrible idea. Nora's bottom two teeth came in about two to three weeks ago, and she's been working on her top two teeth since then. Well, at least I think she has. I mean, I know they're coming in now because her gums are all swollen and weird looking and today I saw a teensy little nub poking through, but has she been teething for two to three weeks? Who knows? I've always wondered about where people come to their teething conclusions. "Oh, she's chewing on everything. She must be teething!" they say. Or "Oh, she's drooling! Is she teething?" Or "She sure seems cranky. Teething?" But here's the thing. Babies chew on stuff, drool, and get cranky. All babies. All the time. 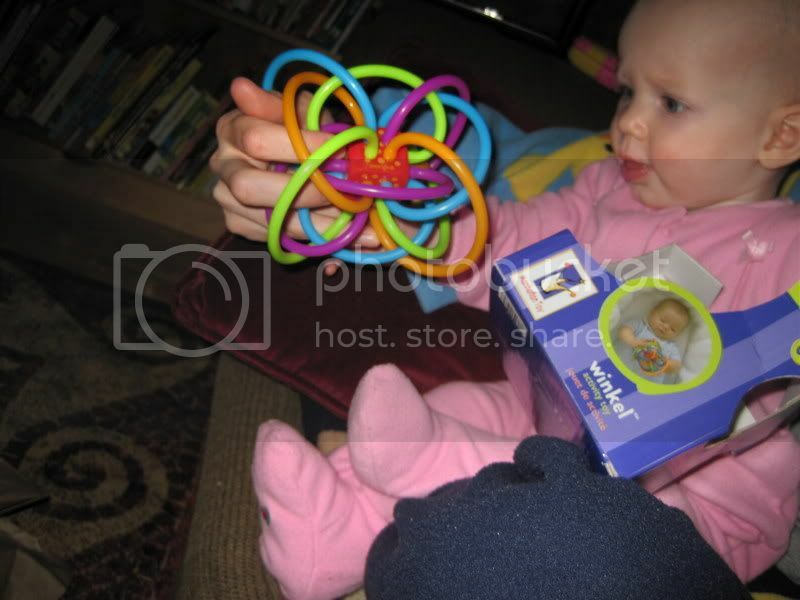 So how are people so sure that THIS time, those things are a sign of teething? My favorite part, however, is how these people who are so sure that the drooling, mouthing baby is teething are always proven correct, because, eventually, teeth appear. So after weeks or even months of, "She's teething" claims, out pop the teeth and they say, "See?" Latest post up at TheBump! Although I live in a cold climate, I own remarkably few sweaters. And I am cold. So for Christmas this year, I told Andrew what I needed, and he passed it along to his mom. Thus it was that on Christmas afternoon, I gratefully opened box after box of cotton pullovers and cardigans along with a few long-sleeved t-shirts. The other day, I was talking to my sister on the phone while trying to upload a file for her. I was also nursing Nora. Got that? Simultaneously using the phone and the computer while nursing the baby. Sayeth Jack, "But WHY can't you help me get dressed right now?" Scene: Dinner table. Dinner is winding down. JACK: When I get big I'll vote. ANDREW: Yes. Voting is a very special thing. JACK: If I were a big big giant, I could look down on the top of your head and say, "Hey." I've been teaching Nora how to drink from a cup. I've been doing this because I sometimes have to use frozen milk to make her cereal, and whatever she doesn't consume I have to throw out. Why not a bottle? Because it is so much fun to watch her try to drink from a cup! Seriously, all you parents of babies should try it. 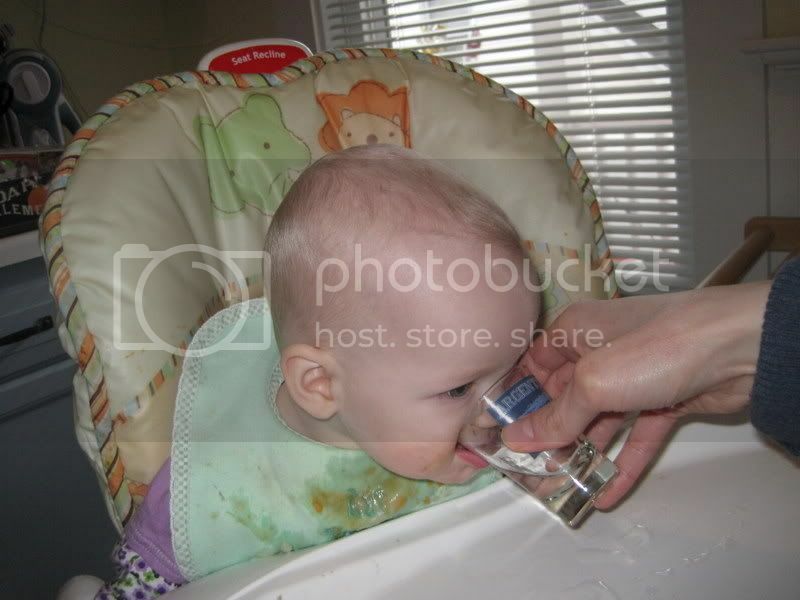 She leans way in and bites the edge of the cup, which, now that she has two bottom teeth poking through, makes a clicking noise. I'm pretty sure that she thinks the biting is a critical step in the drinking process. And sometimes she sticks her tongue into the milk and laps it up like a cat. It is hilarious. Yes. I use a shot glass. It's the perfect size! You will note, however, that the shot glass is made of glass, which makes the following anecdote all the better. This morning, I told Andrew that I started giving Nora water after her solid meals because one of my baby food books says it can help with digestion, and the prunes haven't been cutting it. "I'm going to use the Maryland shot glass, then, instead of the Argentina or Hawaii ones, because we could potentially replace a broken Maryland glass," he said. "Makes sense," I said, because Nora does tend to grab at my hands when I'm giving her a drink, so it's certainly possible to drop the glass. 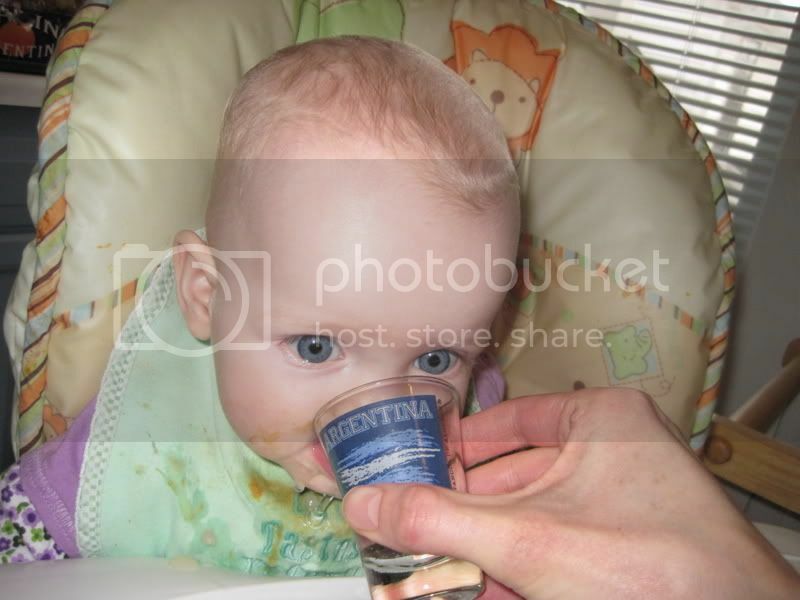 But then I turned around and saw that Andrew had filled a shot glass with water and just given it to the baby. He gave it to her! And walked away! "Andrew!" I said, as I snatched it out of her hands. "You can't just give it to her!" "Well, I thought that's what you said!" he protested. "You thought I gave our six-month old baby a glass cup full of water and you didn't QUESTION me on that?" Oh, you can be sure I'll be bringing this one up for WEEKS. I have already discussed Christmas Eve, which was half good and half bad, at least in terms of child wrangling. The only thing I didn’t tell you was that we went took a risk and went to the 5:30 pm pageant Mass, and it was well worth it, since Nora obligingly slept in her carseat right up until the sign of peace, which was when I would have had to wake her up anyway, since we can’t very well leave her in the pew while we go up to receive communion. (Communion comes shortly after the sign of peace, in case you non-Catholics are confused.) Jack was reasonably well-behaved even though Andrew had to stand in the back with him for a large chunk of the Mass. Apparently there was a threat or two of a time-out, but they were in the back so as far as I was concerned, there were no problems at all. What? I had to stay with the baby! But by the time both children were in bed, our standards for what we wanted to accomplish that night were vastly lowered. Ribbons and bows on the presents, for example, suddenly seemed very unimportant. And figuring out a way to hang a tarp across the living room door so that Jack didn’t see the tree without us? Not going to happen. And so we collapsed into bed around 10:00 or so and hoped for the best. And the best is what we got. First of all, Nora woke only once or so and was at this point still allowing me to put her back in her bed. (Oh, how I long for the days.) Then Jack’s daily morning hike to our bed didn’t happen until 6:00 instead of the usual 5:30. When he did finally climb into bed with us, he told me he loved me and he loved Andrew and he petted me and told me I was “snuggable.” Sunggable! For real! Strange how something that, were it to happen in a movie would make my eyes roll and roll, can be oh! So nice to hear. I believe I actually said, “Well, this is pretty delightful.” And all parties agreed. So then I got up to see if Santa had come and possibly turn on the tree lights and get the camera ready. The morning continued to be delightful. Presents were opened and played with. “Happy Birthday” was sung and single-layer coconut cake was consumed. Andrew and I congratulated each other on going to mass on Christmas Eve, thus ensuring a lazy, unrushed morning. We headed to Andrew’s parents’ house around noon, where we spent an equally delightful afternoon. All in all, it was a fantastic day. We lived off of it for the next week, a week that was pretty awful what with the housebound sick people and the tantrums and the teeth starting to torture the baby, teeth which are now sharp little daggers that CONTINUE to torture the baby. Whose plan was teething, anyway? BAD PLANNING. But I digress. 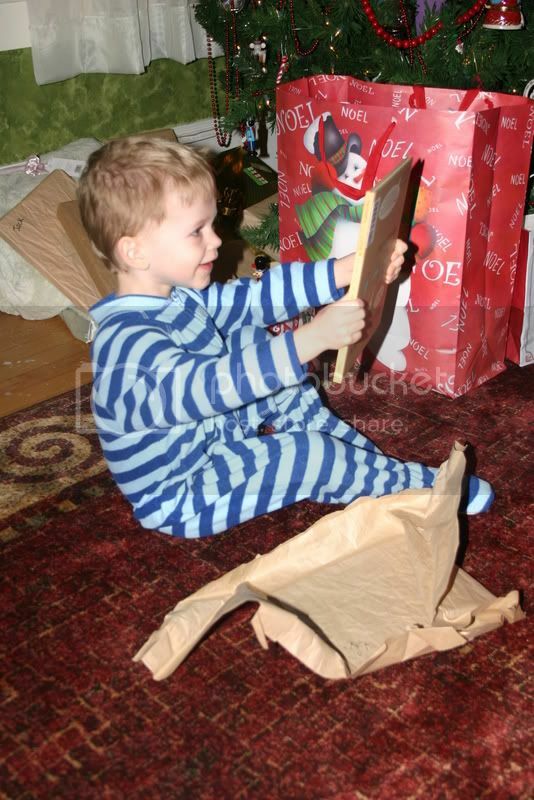 In short, this Christmas, the first Christmas Jack really had any idea what was happening, was our best Christmas yet. 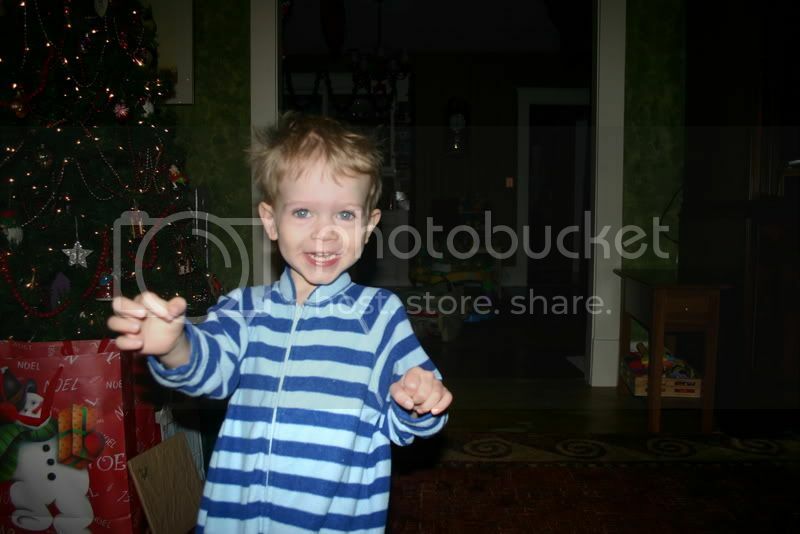 One of my nephews – I think I call him “Elfin Nephew” – has an oppositional personality. Fortunately, his mother happens to be a family therapist and knows how to deal with oppositional children, and we’ve witnessed her spending the last six years saying things like, “Oh, you can’t get dressed in five minutes. No way. It’s too hard.” Jack, however, is not oppositional. We were always able to get him to do stuff by issuing the challenge and assuming he CAN do it, and, for the first three years of his life, that worked. OK, so really for the last year and a half; we didn’t issue him many challenges when he was a newborn, but you get the idea. I took Jack to get his haircut today. I haven't done this in well over a year; Andrew usually brings him when he gets his own cut. It was just as adorable as ever, though, what with the wincing and the giant smock and all. But when the hairdresser asked me if she could use the clippers, I had no idea how Jack would react. He certainly wouldn't have stood for the buzzing clippers the last time I took him to get a haircut, eighteen months ago. We decided to try it, so the hairdresser tried to prepare him. "Look, Jack," she said, holding the clippers. "See this? Look, I can put it on my hand!" Jack smiled uncomfortably at her and gave a bit of a forced laugh. "Can I put it on your hand?" Jack just looked at her. "Here, put it on my hand," I said, and she did. "Look, Jack! Isn't that funny? Oh, it tickles!" Jack laughed again. "Can we put it on your hand?" "Um," he replied, with the air of one explaining something to a child, "those are usually for my hair." Everyone else is busy writing their 2009 retrospectives and resolutions for 2010, but I am going to forge ahead with my post about Christmas anyway. Remember Christmas? 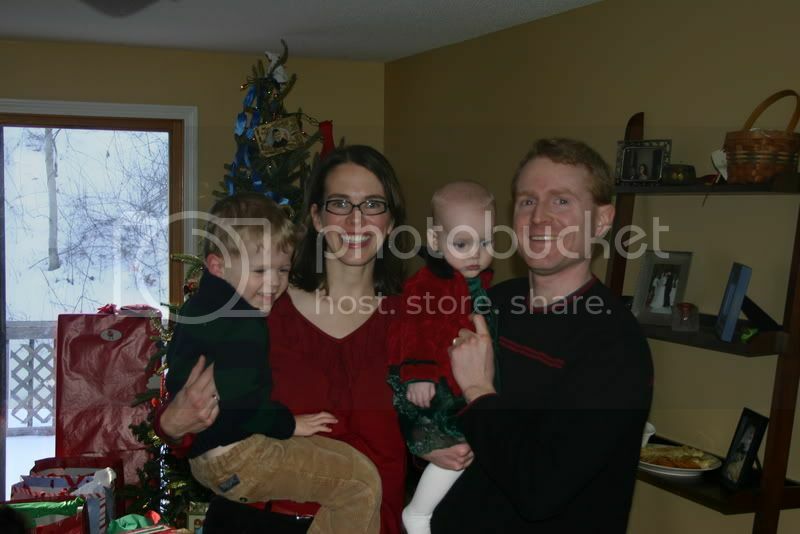 We had a lovely Christmas. Which is a good thing, because all the days AROUND Christmas have been sort of… awful. There’s been a lot of illness and not a lot of sleeping and the tantrums have been excruciating. EXCRUCIATING. Motherhood is just beating me down right now, is what I’m saying. But more on that later, because this post is about Christmas! Which was lovely! Our family festivities started on Christmas Eve when we had plans to go to Big Sister #3’s house for an extended family gathering complete with eleven million cousins of the Jack generation. OK, actually only eleven of Jack and Nora’s cousins, but when you add in Jack and Nora, you get a total of thirteen cousins; nine of whom are under eight years old and six of whom are under four. So it sort of FEELS like eleven million. But as loud as all those little kids can be, I actually love getting together with all the cousins. It’s wonderful to see my parents and all my siblings and their spouses for one thing; for another, with all those cousins to play with Jack could not be less interested in me so I actually get to participate in the adult conversation. Also, if I’m at a party, it means I’m not supposed to be cleaning the bathroom or preparing dinner or doing the budget or the like, so if Nora demands to be held nonstop, I can just hold her! No problem! Sometimes this comes with some guilty feelings because it means Andrew is stuck dealing with any discipline issues that arise with the preschooler, but then I just sip my wine until those feelings pass. And so the party was a success. Getting to the party, however, was filled with a touch more strife, because we had a certain number of chores to get through before we could go. 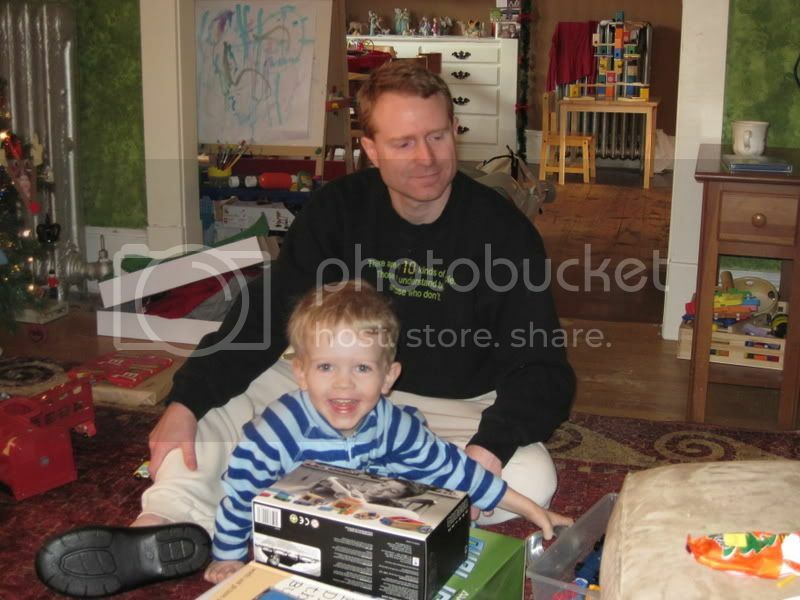 I wanted the house to be at least RELATIVELY clean for Christmas morning, for example, and since The Great Respiratory Illness of 2009 had me sidelined for most of the month, we had a bit of an uphill battle on that front. Additionally, I wanted to make the coconut layer cake for Christmas morning to continue our new tradition of having Jesus’ birthday cake with Christmas breakfast. Unfortunately, Jack was completely wound up and running around like a nutcase, making these chores particularly difficult to get through. And then, in a bonus little “pbtthh on you!” from fate, I dropped one of the cake layers while trying to tip it out of the pan. I would have taken a picture of the sad little pile of broken cake pieces, but I did not have time to get the camera because I had to stop Jack from LICKING IT UP OFF THE FLOOR LIKE A DOG. Ah, three. What a fun year! And now Nora has awoken from her Ergo nap, so I have to shower and get dressed and get everyone else dressed so we can go visit the grandparents because we need to GET OUT OF THE HOUSE and SEE PEOPLE. (See above re: beaten down.) So I will be back to tell you about the good parts of Christmas, of which there were many. And then I’ll return to complaining.